Come 2020, Formula 1 will visit the capital of one of the world's fastest-growing economies: Hanoi, Vietnam. City officials of Vietnam's capital Hanoi and Formula 1 announced Wednesday that there will be a Grand Prix held on the city's streets starting in April of 2020. The planned route for the circuit is 5.565 kilometers (3.46 miles) in length and features 22 corners, taken counterclockwise. It features a 1.5-kilometer (4,921-foot) back straight, which dwarfs even the 4,100-foot bridge section of the proposed Miami Grand Prix route, and is more than 1,000 feet longer than the lengthiest straight on the 2018 calendar—Baku's pit straight is just over 3,900 feet. Officials predict trap speeds of 335 kilometers per hour (208 miles per hour) on the straight, which will make it a prime place for overtaking given the FIA's plan to power-up Drag Reduction Systems with the 2019 aero regulations. 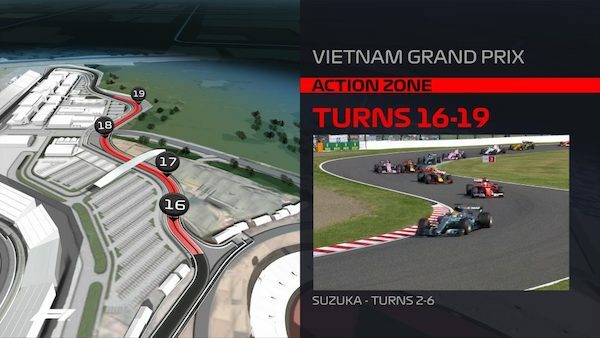 Its smaller, but still lengthy 675-meter (2,215-foot) pit straight and an 800-meter (2,625-foot) tertiary straight between the two will also be areas likely to feature heavy overtaking. A fourth straight of unspecified but still considerable length sits between the backstretch and a flowing third sector, which was inspired by both the Monaco and Japanese Grand Prix circuits. It will feed back into Sector 1 and the pits, which are unusual in that their entrance skips both the first and last corners, similar to the Singapore Grand Prix. 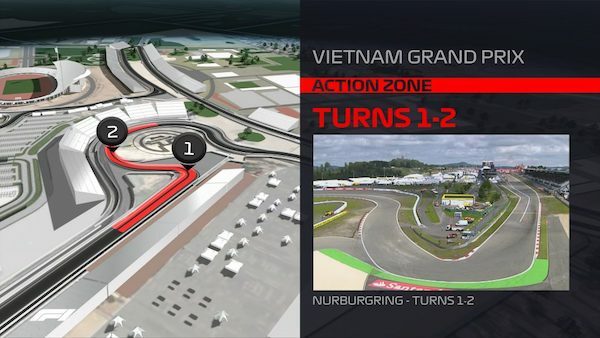 Instead, the pits will exit into the looping Turn 2, reminiscent of the Russian Grand Prix's long Turn 4. The lesser impact that pit stops will have on lap times could encourage multi-stop strategies, increasing the race's unpredictability. 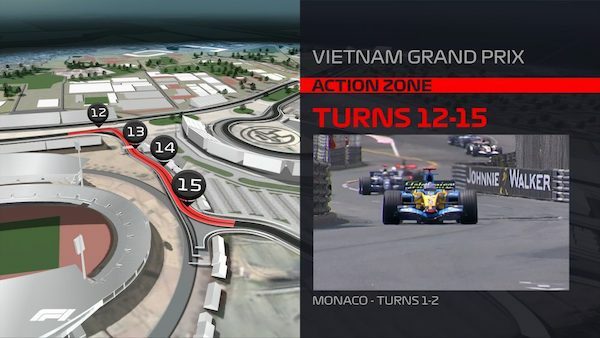 Similar to the Azerbaijan Grand Prix, the Vietnamese Grand Prix will force teams to compromise their car setup. Its fast-flowing third sector, slow technical corners, and tremendous straights each require differing car setups to achieve maximum pace and could promote repeated overtake battles among similarly quick cars. Hanoi's appeal to F1 fans likely won't just be down to its track—which could rapidly become a fan favorite like Baku—but also because of the city's sights, culture, and history. "We are proud to be hosting the Formula 1 Vietnamese Grand Prix, and showcasing the city of Hanoi to the world with its special combination of ancient and modern beauty from 2020," said city chairman Nguyen Duc Chung. "It's a further demonstration of Vietnam’s ability, as one of the fastest growing economies in the world to host events on a global scale and attract tourism to the country. It provides an opportunity for inward investment to Vietnam and importantly to bring the exciting wheel to wheel racing of Formula 1 to the people of Vietnam." Nguyen Viet Quang, spokesperson for race promoter Vingroup, touted the race's potential economic impact, which he says could add local jobs, force improved infrastructure, and draw attention to the city as a venue for international events. Additionally, it could help Vingroup promote VinFast, Vietnam's first domestic automaker. "Since we became involved in this sport in 2017, we have talked about developing new destination cities to broaden the appeal of Formula 1 and the Vietnamese Grand Prix is a realization of that ambition," added Liberty Media CEO Chase Carey. "We are thrilled to be here in Hanoi, one of the most exciting cities in the world right now with such a rich history and an incredible future ahead of it. This is the perfect formula for Grand Prix racing and I look forward to this becoming a real highlight of the F1 calendar."